Supra Alloys provides the convenience of one-stop shopping by offering value-added processing in-house at our Camarillo, CA facility. Cut-to-size shapes and products are available with relatively short lead times. 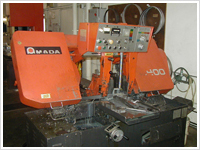 Supra's production services include in-house saw cutting, shearing, and custom slitting of strip. We are also able to provide chemical milling, under controlled conditions, to ensure close tolerances and provide off-standard gauge requirements. Contact Supra today for precision processing of our comprehensive titanium supply of sheet and plate, pure grade and titanium alloy bar, rod, and tubing. Call 1.888.647.8772 for immediate service!